Anyone who grows some of their own food will know that success is a moveable feast! Two years ago my attempt at growing tomatoes outdoors was a failure. The garden is very windy and the ground just didn’t get warm enough for the plants to develop, so in 2015 tomatoes were indoors, link to the feature. However growing indoors allows access to juicy morsels to unwanted creatures without the usual predators to control them. Always wanting to use natural deterrents I keep a pyrethrum based spray handy. However disaster struck when I inadvertently used the wrong spray. What happened? I noticed a couple of little flies in the conservatory, the kind that lay eggs in the soil and the grubs eat the roots and the plants die. So I rushed around looking for the pyrethrum can, found it and sprayed assiduously all the plants and seedlings. To my absolute horror I realised I had used a weedkiller spray instead. I rushed around again, found the water spray and desperately watered. To no avail, within 24 hours little brown spots had appeared on some of the leaves and over the next week everything was on the way out. There was nothing for it but to start again. I contacted Delfland Nurseries who raise organic vegetable plugs and they sent me basil, chilli, sweet peppers and squash replacements. I resowed tagetes, nigella and limnanthes to serve as companion plants. If you are keen to find out about using plants as decoys to insects like black fly and attract pollinators like bumblebees and overfills, have a look the guide provided on the Thompson & Morgan website, from which you will see basil is a good companion plant for tomatoes, as are chives and mint. Companion plants in the vegetable garden, notice the seat, essential for contemplation! We grow a lot of companion plants every year and will do the same this year – nasturtiums, a great space filler and colourful companion plants germinate without any help from us from last year’s seed! Half the plugs Delfland grow are organic own vegetable plugs and each month you can choose a ‘selection pack’ of brassicas, salads, glasshouse or herbs and more. Here’s a link to the ordering options. For those of you who find the planning of seed sowing and remembering to keep to the schedule a hassle, will find these plugs so useful when you have run out of space for early sowings or when you don’t want a whole packetful of plants from seed raising. Delfland now have bedding and other plants for sale as well as ready-made hanging baskets and pots planted in various colour schemes – now that appeals to us! This has to be one of the best websites we have found for gardeners who enjoy growing their own vegetables. Delfland provide really good quality plants and great service. Do have a look! Our guest contributor, Anne Tilby Jones visited The V&A exhibition, David Bowie Is, in 2013, which showed the fantastic imagination and creations of David Bowie spanning five decades. We thought you might like to read her feature. Such a legacy he left behind, a real ‘one off’ personality. Just love him! So you like air fresheners, room fresheners, smells of all kinds from perfumes to deodorants, linen sprays, the list goes on and on. Worried? The answer could be to get a copy of Dr B C Wolverton’s book How to Grow Fresh Air: Grow and nurture 50 houseplants to ensure you have clean, non-polluted air in your home and office. Written as a result of research designed to create a breathable environment for a NASA lunar habitat, space stations, Bill Wolverton discovered houseplants are the best filters of common pollutants, such as ammonia, formaldehyde and benzene, chemicals released by furniture, carpets, building materials and photocopies and then trapped by closed ventilation leading to respiratory and allergic problems, now referred to as Sick Building Sydrome. His book shows you how to grow 50 plants as accessible and trouble free as the tulip and Boston fern. Each plant is rated for its effectiveness in removing various pollutants. Of the houseplants that fall into the category of eco friendly according to Wolverton a rubber plant is the most likely to be successful. Bred for toughness, it will survive in less light than most plants its size. It has a high resistance to insect infestation and is easy to grow and, very important, is especially effective at removing formaldehyde most often found in furnishings that take years to cease emitting fumes. This is my absolute favourite indoor plant book and one I would never be without. Easy to understand, well illustrated and it makes sense! Some research has shown a link to dementia and man made chemicals. So all in all, air fresheners and the like are out. Pity, we really liked them. We subscribe to Freegle, a website that facilitates giving away and requesting items which leads to reducing the amount put into the waste fill sites. Guess who’s going to ask for rubber tree plants! They grow pretty big and people often want to give them away. We have a lovely conservatory that would provide a good home for anything large … and rubber tree plants would be most welcome. This peace lily was a Freegle plant. It loves the bathroom but it will probably migrate to the sitting room with its new carpet. Just so you know we are not affiliated to Amazon, or anyone for that matter. We believe in free speech and the free exchange of positive, personal experience. Would you like a feature to appear here? We have roughly 750+ hits a week, from all over the world. We are advertisement free so please don’t embarrass us by our having to refuse kind offers. Climbing strawberries with a fruiting period from June to September, now there’s a thing! In 2008 we wrote an article about the Thompson & Morgan strawberry Mount Everest. It grew well for us and our readers. We had six plants to grow and hoped for great things, especially to make jam. 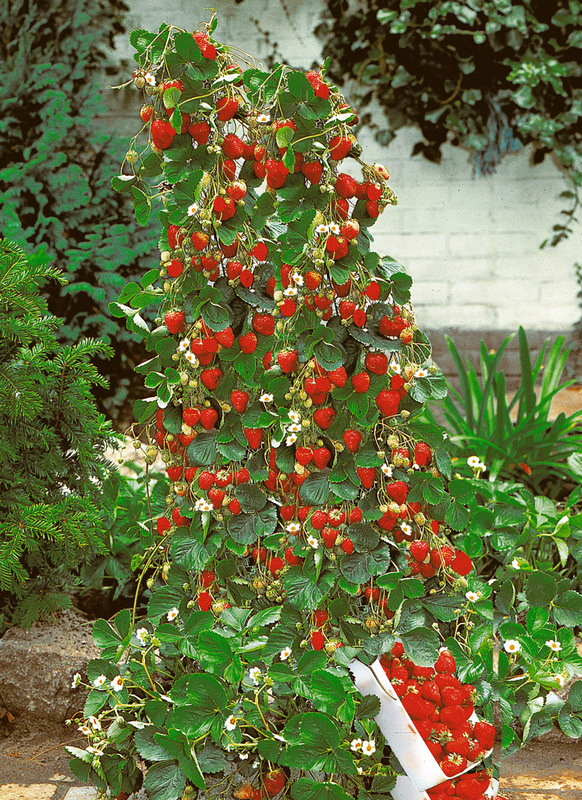 This year we will be trying Strawberry Skyline with climbing stems and dangling fruit from every runner! The perfect option for anyone short on space, the climbing habit also brings other added benefits – you can get to the fruit before the slugs do, there’s no need for straw to keep the ripening fruits off the soil, and no back-breaking bending to pick your crop. Plant in the soil under trellis or pea netting, or grow on the patio with the T&M Towerpot® climber system for easy access to the fruits. We will be using the Towerpot this year in the conservatory and in the greenhouse as a comparison. Our 2014 strawberry growing was not a huge success. Here in Cumbria we have a shorter growing season than further south. So in 2015 we decided to grow our strawberries in the glazed entry hall to offset the lower temperatures outside. For Flamenco another T&M everbearing strawberry, we used strawberry bags. They grew well, had a wonderful harvest which the mice and slugs relished so they were moved into a glazed link between the stables and the coach house*. They did well there. We tried Eternal Love a variety from Lubera that went on and on fruiting right up to the first frosts. We have kept a dozen runners to grow on, the fruit tasted really good. This year we are trying another Lubera variety, Fraisibelle. All kinds of soils and conditions seem to suit it from light to heavy soil, partial shade to full sun. As always we travel optimistically and have visions of rows of strawberry jam in the larder! We managed some what we called freezer jam. Much simpler than conventional jam making, although it produces a soft rather than a very firm set. There are easy instructions on the Certo recipes webpage. The ‘jam’ is so tasty and delicious on ice cream, cereal, and in cakes. We always make sure there is always some Certo in the cupboard year round. So this year it’ll be delicious freezer strawberry jam again and maybe even ice cream made from unsprayed homegrown fruit! *Why not come and visit us? We have converted our 1700’s old stone built coach house into a self contained warm and cosy cottage for holiday lets, short and long, any time of year. Here is a link – we grow many different companion plants and insect attractive flowers to maximise our fruit and veg in the kitchen garden. Do come! We love talking gardening! Companion plants in the kitchen garden, note the seat!